Nothing signals the arrival of spring quite like the sight of delicate white snowdrops popping their heads up through the soil, spots of purple and yellow here and there as croci add welcome flecks of colour to the display. From the formal lawns and beds of Pitmedden Garden in Aberdeenshire to the West Coast woodlands of Arduaine and the Royal Botanic Garden Edinburgh (RBGE) with its majestic glasshouses, Scotland’s horticulture scene is nothing if not varied. It’s no wonder nearly 700,000 British holidaymakers visit a Scottish garden each year. According to research conducted by VisitScotland, 35,000 of these visitors indicated that a garden visit was the main reason for their holiday. In terms of tourism spend, the market is worth over £200 million to Scotland. Last May saw the launch of Discover Scottish Gardens, a group of businesses and organisations at the heart of Scotland’s garden sector, which aims to grow visits to Scottish gardens by 10 per cent by 2020 as well as to create somewhere visitors can go to find a new plant nursery, woodland, orchard or garden to visit. “We have got hundreds of wonderful gardens, woodlands and plant nurseries across Scotland but until now there hasn’t been one central place to go to find out about visiting them,” says Clare Willis, marketing manager at the National Trust for Scotland (NTS) and board member of Discover Scottish Gardens. “Discover Scottish Gardens is a new national group which was established to raise the profile of these gardens both nationally and internationally and to showcase Scotland’s outstanding horticultural offering to the world. Founding members of the group include representatives from RBGE, NTS, Scotland’s Gardens, Cambo Estate in Fife, Attadale Gardens and Brightwater Holidays. “We were awarded VisitScotland growth funding for the campaign and worked with a local creative agency to create a new brand identity, logo, leaflet and website. The group also runs social media channels to let people know what’s currently in bloom and to celebrate the changing seasons in Scotland’s gardens. Each year from the end of January to the second week in March, around 60 properties in Scotland take part in the Snowdrop Festival where visitors can admire blankets of white flowers covering the ground as well as guided walks, gardening talks and teas. 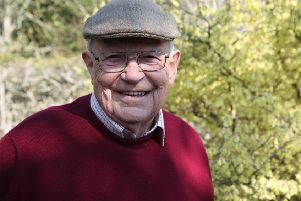 “Spring is a great time to get out and enjoy some fresh air after spending so much time at home with the central heating on over the winter,” says Willis. “Many gardens start to come alive in early spring providing plenty of colour as they burst into life over the coming months. Willis also recommends Malleny Garden in Balerno where visitors can enjoy seeing some winter flowering shrubs in the shadows of the “disciples”, four great yew trees that the garden is known for. The larch tree flowers at Newhailes in Musselburgh are also at their best in the spring. “Looking ahead, rhododendrons will be flowering from May time depending on the weather,” says Willis. “The RBGE has some stunning examples as do many of the glorious gardens of Argyll which have created a festival of rhododendrons to showcase the many different varieties. This article first appeared in EH50, the free magazine published by the Edinburgh Evening News and available to pick up in doctors, dentists and retail outlets or from the Evening News offices. An online version can be read here.